Dark Side of the Moon. Concert. The Kent Stage, Kent, Ohio January 25, 2013. 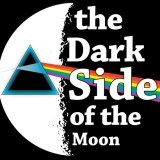 Dark Side of the Moon (DSOTM), not to be confused with Acoustic Side of the Moon or the full band Wish You Were Here, is composed of members from around Northeast Ohio, centering in the Akron/Summit county area. They bring not just the music of Pink Floyd, but a full Pink Floyd experience which those of us too young to have seen Pink Floyd in person very much appreciate. A full DSOTM show includes music, light show, smoke machine, audience participation, and visual artists working on Pink Floyd-themed artwork. The visual artists were a special treat, and the subject of plenty of attention, as their original works were obviously their own creations, inspired by and drawing from the sounds of the night. One piece was sold immediately after the show, and the other had been commissioned by his wife as a gift for the saxophonist, Steve Pickerel. This particular night was cold and snowy, but that did not deter the many current fans of DSOTM from making their way to the Kent Stage for a three-hour sensual experience, and the band members did anything but disappoint those braving the weather. Friday night’s music drew from all portions of the Pink Floyd discography, including both rock icons like “Dark Side of the Moon” and more obscure pieces such as “Great Gig in the Sky.” There was no opener on Friday, allowing more time for DSOTM, but those of us arriving early did get to hear the tail end of practice for the band while waiting in the Kent Stage lobby. The audience consisted of all ages, from young kids to the lead vocalist’s grandmothers, aged 82 and 90 years. In my opinion, this span speaks volumes to both the timelessness of the music and the ability of the band. The first set included some lesser known and more instrumental pieces. There were some sampled/pre-recorded selections, but in music as iconic as Pink Floyd this seemed less a distraction, and added little reminders of where various selections came from (who could imagine “Breathe” without the intro sounds of slot machines, laughing, etc.?). The music was technically solid, and definitely worthy of the label “Pink Floyd tribute band”. I really appreciated the improvisational ability of the group, as well, since Pink Floyd was known for having exceptional talent in this arena, although most covers are note-for-note copies of the music. At the critical saxophone solo in “Us and Them,” Pickerel actually came off of stage and popped up in the middle of the seating to play while standing on the seats. After a brief intermission, DSOTM resumed playing for another extended set, this time with more standard fare like “Money” and selections from The Wall. This set was heavy on the smoke machine, obscuring the band and artists, and distinctly altering the tonal qualities of the music; more reverberation, distortion, and echo all were obvious, and added an almost surreal quality to the show. By the second set, there were more calls for audience participation, call-and-response games, and beat-clapping. There was also more dancing in the aisles and random whoops and hollers, but I feel safe that was more due to visits to the bar over intermission than the band’s encouragement. At the end of the set, the band finally introduced themselves, and announced that it was the eve of keyboarder Ray Beeble’s birthday. The encore was much appreciated and obviously not a standard set, as shown by the bits of chatter and random playing done in between pieces. It easily would have gone on all night, if the audience had had their wish. All in all, the show was quite an experience, and really a feat of strength with as much passion as DSOTM put into those three hours. Check out their website, and if you can, go see Dark Side of the Moon soon. Robert Cassidy plays Debussy, Mozart, and Noon. This recording represents Cassidy’s first solo commercial studio album, however, he is no stranger to classical listeners in Northeast Ohio or North America. Robert Cassidy holds Doctor of Arts degree in Piano Chamber Music and Accompanying/ Piano Performance from Ball State University, where he studied with Robert Palmer, and his undergraduate work resulted in Bachelors and Masters degrees in Piano Performance from the Manhattan School of Music, where he studied with Solomon Mikowsky, Constance Keene, and Marc Silverman. Dr. Cassidy has performed in the US and Canada, live and on radio, alone and with others including the Almeda Trio and The Cleveland Symphony Orchestra. He currently lives in Shaker Heights, Ohio. Cassidy’s rendition of Debussy’s Préludes, Book I, is nothing short of moving. 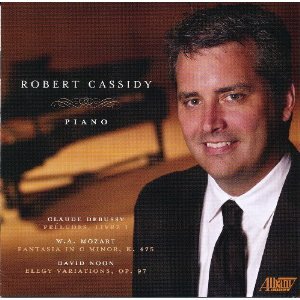 I will out myself as a huge fan of Debussy in general, but Cassidy manages to make these works shine. Debussy, while not the only track on the album, takes up the lion’s share of the time (43 out of 62 minutes), and covers "Danseuses de Delphes," "Voiles," "Le vent dans la plaine," "‘Les sons et les parfums tournent dans l'air du soir,’" "Les collines d'Anacapri," "Des pas sur la neige," "Ce qu'a vu le vent d'ouest," "La fille aux cheveux de lin," "La sérénade interrompue," "La cathédrale engloutie," "La danse de Puck," and "Minstrels," each as individual tracks. This is a nice way to chunk such a large piece, and is consistent with the way the pieces were originally written, although they’re typically played as sets of three or four in my experience. Hearing the entire book in its entirety was special, and Dr. Cassidy performed well through all of it. The dynamics cover a wide range, and do take a bit of adjusting, but if you’re at home, once you find a sweet spot, the time spent is worth it to avoid being blown away by the louder portions or struggling to hear the softest. Skip the iPod with ear buds or laptop speakers for this one, and listen someplace with good sound for the most enjoyment. Debussy’s penchant for having the left and right hands doing drastically different things is no challenge for Cassidy, and not once could I hear him trip up. At the same time, he played with the emotion and feeling that this selection requires. Mozart’s "Fantasia in C Minor, K. 475" has far less dynamic range, but is an enjoyable rendition also. The piece is probably something that you’ve heard before, if you like piano, but it’s not one of Mozart’s most famous pieces, so there are fewer expectations than other Mozart selections would have. This combination of familiarity and newness, along with the similar feel, make it a nice accompaniment to Debussy’s work. Noon’s "Elegy Variations," the ending and shortest piece, however, is quite a departure from the rest of the album. The beginning is most noticeable as a break from what has happened before it, although movements within the work do hearken back to earlier tracks as well. 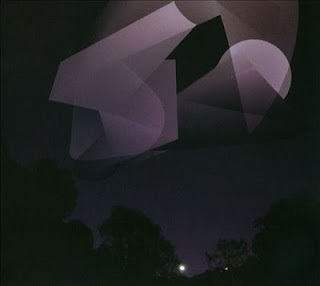 Those fleeting glimpses interspersed with almost harsh sounds have a vaguely disconcerting effect that leaves the listener wanting to seek out more of Noon’s work, or at least it did for me. Cassidy again plays well through both of these final tracks, and is someone whom I’ll be looking for in the Northeast Ohio and radio music scenes, that much is for sure. As an added bonus, this album has a solid appeal across ages, kept my first-grader’s attention through most of it, and has gotten him more interested in how to make similar sounds on his own. We’re still deciding if his new-found desire to compose on the piano at home is such a good thing, though- there’s a fine line between chromatically dissonant and clanging that the first-grader has yet to successfully navigate. Tracks: Claude Debussy’s Préludes, Livre I; Wolfgang Amadeus Mozart’s Fantasia in C Minor, K.475; David Noon’s Elegy Variations, Op. 97. Emeralds. Just to Feel Anything. The trio of Clevelanders has put out more than a dozen albums, but good luck getting your hands on most of them, at least in physical format. Most are CD-Rs or cassettes. The last couple have been released on Editions Mego, and are available through Amazon. Individual members have put out solo releases as well. My first impression even before listening to the album is quite negative. The company has printed all the track information in purple on black, making those of us with some degree of myopia and astigmatism lean toward fits of rage. It’s not a good start when you can’t read the notes, but it gets better after that. The music is really quite enjoyable. 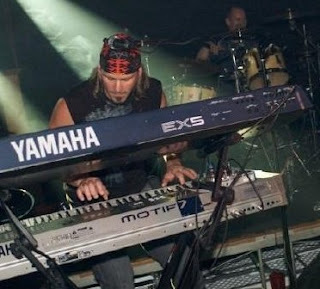 All instrumental, the band combines synthesizers, drum machines, and guitars in various improvised combinations, often playing the percussion against the guitar, to good effect. McGuire’s guitar work reminds me of Robin Guthrie’s, with a strong and muscular feel that is simultaneously laid back. I can do without the bubbly drum machine on “Adrenochrome” and “Everything is Inverted,” which sounds imitative of some European electronic groups. Once it recedes to the background, the music is more solid, being replaced by guitar or synthesizer. “Through & Through” is very atmospheric, with the synthesizer sounding a bit choir-like (or are those real vocals? ), a nice effect. The band takes a turn in approach and emotional tone when it reaches “The Loser Keeps America Clean,” which sounds more cinematic. In the title track, the drum machine seems less a distraction than an integral part of the music, and isn’t pushed aside as in the earlier tunes. Less bubbly and more driving, it is overlain by the other instruments, and the track has a good deal of forward motion, clean and brisk in sound, in a wind-in-your-hair going down the highway sort of way. It’s the track I like the best. The final tune is a slower, more melancholy and meditative affair dominated by the guitar, slowly giving way to the synthesizer, and works well as a windup to the seven tracks. Overall, this is a fine album, worth multiple listens, especially for the interplay of the instruments and the fine guitar work. Now I’ll have to go back and listen to their earlier stuff. Personnel: John Elliott, Steve Hauschildt, Mark McGuire. Tracks: Before Your Eyes, Adrenochrome, Through & Through, Everything is Inverted, The Loser Keeps America Clean, Just to Feel Anything, Search for Me in the Wasteland. 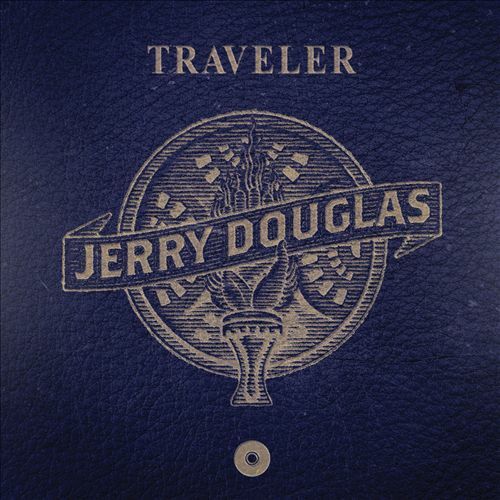 I’ve enjoyed the music of dobro master Jerry Douglas for years. I’ve even reviewed two other albums of his for another web site. What I never paid attention to was the fact that he was born and grew up in Warren, Ohio, just down the road from Hiram. This officially makes him eligible for inclusion here. Strangely, his new release lists his birthplace as New Orleans on the fictional passport included as part of the booklet art. Every album he makes is different from the previous ones in some significant way. That is partly due to the eclectic nature of his musical tastes, from bluegrass to jazz, country to blues, and even rock. 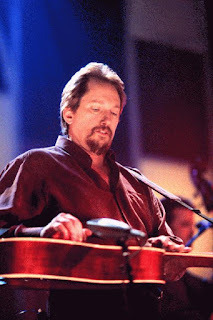 He’s been a member of several bands, including the Country Gentlemen and the Bluegrass Cardinals, and done session work with nearly everybody. This time out he brings nearly everybody in to help him out on a batch of mostly blues/bluegrass-oriented tunes. Guests include Eric Clapton, Alison Krauss, Paul Simon, Dr. John, Keb’ Mo’, and Mumford & Sons, on songs by Leadbelly, Huey P. Smith, Chris Kenner, Paul Simon, and several originals. In order to get all these folks he had to record the album in five different studios in New Orleans, Montreal, Nashville, and elsewhere. Hence the title, Traveler. Every song here is a winner, and I enjoyed hearing them multiple times, with one exception. Paul Simon’s “The Boxer” simply wasn’t very interesting, even though it was sung by Simon himself, with Mumford & Sons backing with Douglas. Simon sounds like he phoned his performance in, and it just replicates the original for the most part. Others may differ in their opinions, and I never much liked the song to begin with, so I may not be the best judge here. All in all, this is a fine album, and anyone who has enjoyed the work of this fine musician ought to give it a listen. Personnel: Jerry Douglas (dobro, lap steel guitar, slide guitar, vocals), and guest musicians too numerous to mention (but already did up above). Tracks: On a Monday, Something You Got, So Here We Are, The Boxer, Duke and Cookie, High Blood Pressure, Gone to Fortingall, Right on Time, American Tune/Spain, Frozen Fields, King Silkie.